Every time NASA launches a space shuttle we see a lot of reporters and media representatives descend on the press site at Kennedy Space Center. Last week as we got ready to launch STS-119 we thought it would be an excellent opportunity to take some of the reporters around to see the Ares I-X hardware. Right now, most of the pieces of the rocket are at KSC in various stages of processing and preparation, so there was plenty to see. About 30 media reps joined us for a quick presentation and a Q&A session with Ares I-X Mission Manager, Bob Ess and Deputy Mission Manager, Jon Cowart. Afterward, everyone jumped on a bus and headed out on a tour of the processing facilities. 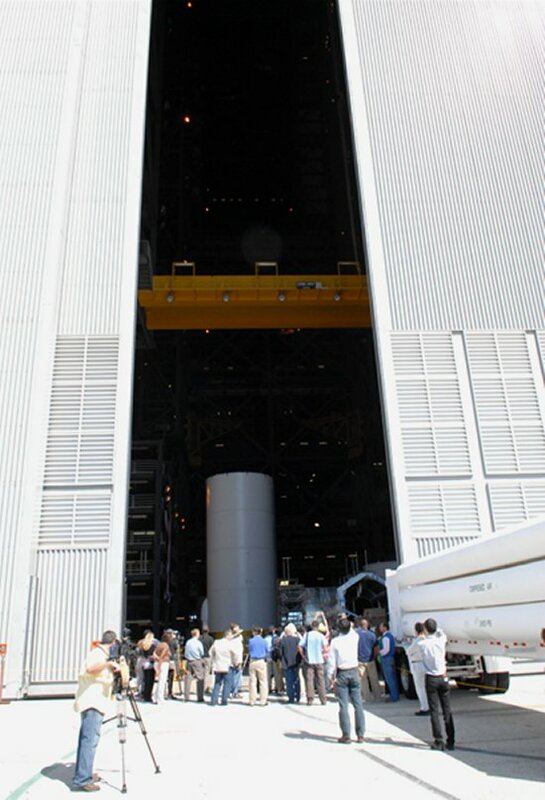 We all got an up-close view of the hardware, the facilities and the people of the Ares I-X mission. First, we stopped at Launch Pad 39B — the one Ares I-X will use — were we got a quick explanation of work being done to prepare the pad for launch. The reporters snapped shots of the new, 600-foot lightning towers surrounding the pad. 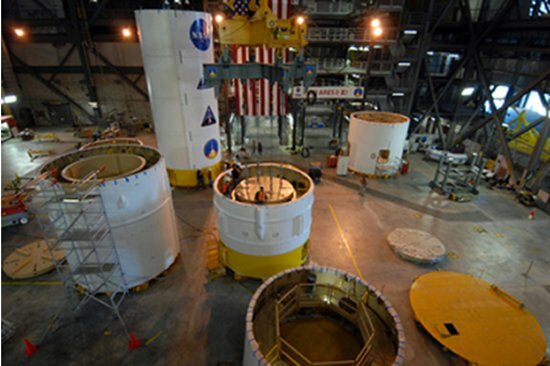 Then we went to the Assembly Refurbishment Facility, or ARF (yeah, I know), where we saw pieces of the first stage, including the aft skirt, forward skirt extension, forward skirt and frustum. Jon showed us all around and explained how each of the pieces will fit together to make the complete first stage. 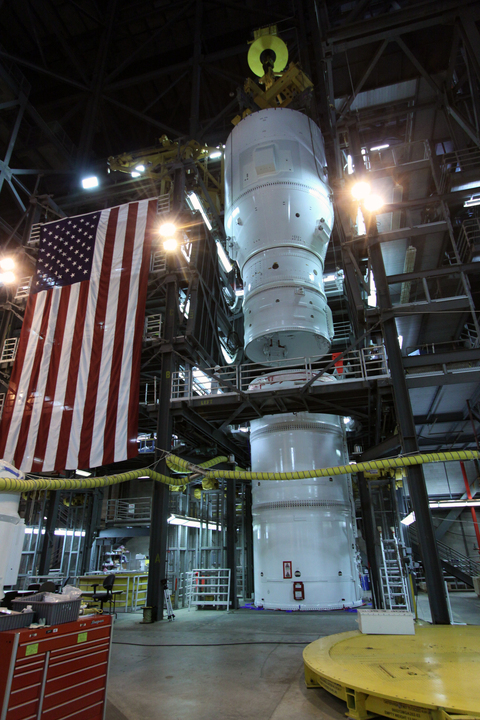 The tour ended in the Vehicle Assembly Building — where the rocket will be stacked prior to being rolled out to the launch pad — where media took a peek at the pieces of hardware — remember the tuna cans? 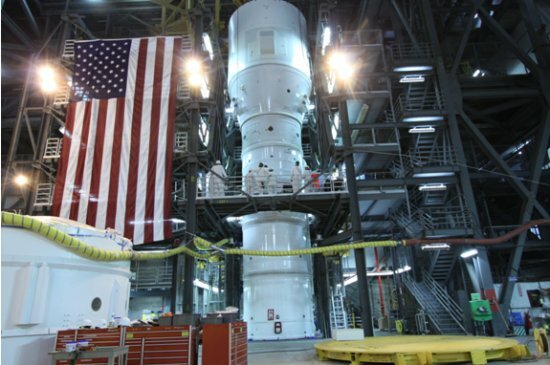 — that make up the upper stage simulator, as well as the simulated crew module and launch abort system that will top off the 327-foot vehicle for the test flight.